Light: Leaping at a new opportunity. Being a cheerleader or ardent advocate for your cause. Being a True Believer. Taking first steps toward independence. Trusting in your own abilities. Asking for feedback. Shadow: Basing your entire self-image on what others think. Seizing every new idea that comes your way without question. Habitually discounting input or feedback from others. Being so eager to “do it yourself” that you hinder your own progress. 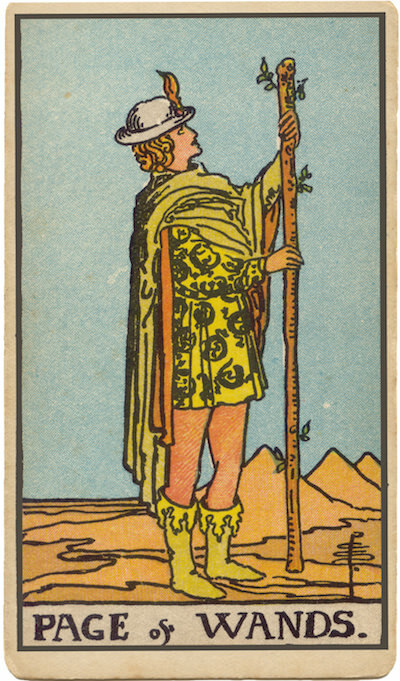 Personality: The Page of Wands can represent anyone who wants to learn (Page) how to make something happen (Wands), especially in academic, romantic, and professional areas of life. The Page may also represent the tendency to be more eager than well-informed or a need to learn by doing. Story: The Main Character’s doubts about himself or herself are dispelled by a positive experience. Relationships. Be eager to try new things, especially activities that fall outside your comfort zone. Don’t hide your emotions: let eagerness show. Be vulnerable; if you don’t know what to do, admit it. Learn from a more experienced lover, or take someone under your wing. Work. Be honest about your ability—or your lack of ability. When someone uses a term you don’t know, ask for a definition. Watch for opportunities to be a student and to learn new programs and processes. Your ignorance can be a tool, helping you see what others will dismiss. Spirituality. Pledge to fully experience (or recapture) the thrill of exploring new spiritual horizons. Read a book for beginners—even if you’ve been involved in your practice for decades. Consider teaching others; beginners should find a trustworthy teacher. Personal Growth. Make something happen! List your goals, determine what needs to be done, pick a target, and take those first steps. Learning new tricks keep the mind and body young. A mature soul sets ego aside and embraces the unknown with eagerness. Fortune Telling. This card represents a young man or woman with a fiery, enthusiastic demeanor, likely born a Cancer, Leo, or Virgo, who wants to start a new relationship with you. When? Between June 21st and September 22nd. The Romantic Pose. Most RWS-inspired cards will feature a young man in impractical attire, gazing at a Wand as though it were a lover. The Page feels intently the fiery grip of passion, but lacks the experience to know how such intense emotion should be put into action. Sound familiar? Awkwardness. In addition to the Page’s yearning gaze, he is frequently posed in a manner that suggests awkwardness or clumsiness. Are you dealing with someone too young (or young at heart) to be emotionally or intentionally stable? The Need for Affirmation. When learning a new skill, good feedback speeds our progress and boosts our confidence. The best students know this, and seek out worthy teachers to evaluate their work. The Marseilles Image. Is it a walking stick? Is it a weapon? The Marseilles Page of Wands isn’t sure, and his stiff pose and awkward grip betray his uncertainty. Rather than allow your own actions to betray your uncertainties, be proactive: ask for help. How easily do you admit your own inexperience? How can you be a better student or employee? What qualities would make a total beginner’s voyage of discovery easier?